On Tuesday, it was reported on Ukrainian social media that Babchenko, who moved to Ukraine in 2017, was shot dead in the stairwell of his apartment building, information which was later confirmed by the Ukrainian authorities. However, on Wednesday, the journalist appeared at a press conference hosted by SBU chief Vasyl Hrytsak, who said that earlier reports about the murder were part of an operation to thwart a real assassination plot targeting Babchenko. Herman, an owner of a weapons-manufacturing firm, was detained in Kiev on Wednesday. Prosecutors demanded his arrest for 60 days. "To satisfy the [prosecutors'] petition… to apply to suspect Herman the measure of restraint in the form of arrest without bail," Judge Victoria Svitlitskaya announced the court decision. 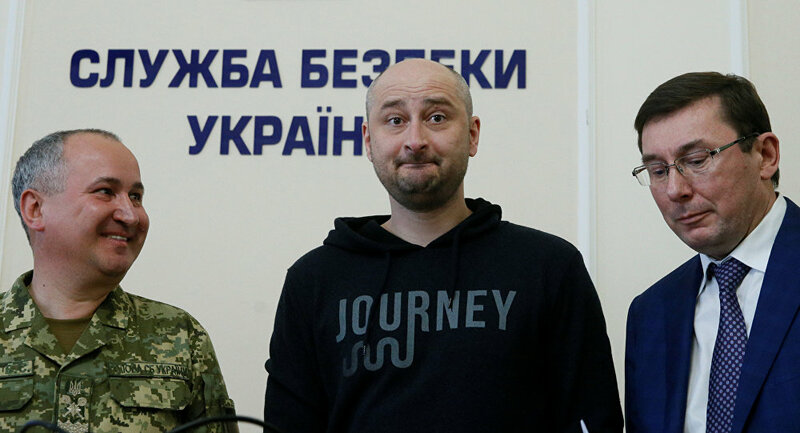 On Wednesday, Russian Foreign Ministry spokeswoman Maria Zakharova called the fact that Babchenko was alive "the best news," adding that the SBU operation was clearly being used for the purposes of propaganda. Reporters Without Borders Secretary General Christophe Deloire, in turn, condemned the operation of the Ukrainian authorities, arguing that it was used as means of information warfare.